Sleek and modern or ruffled and rusted, aluminum has many attractive qualities. 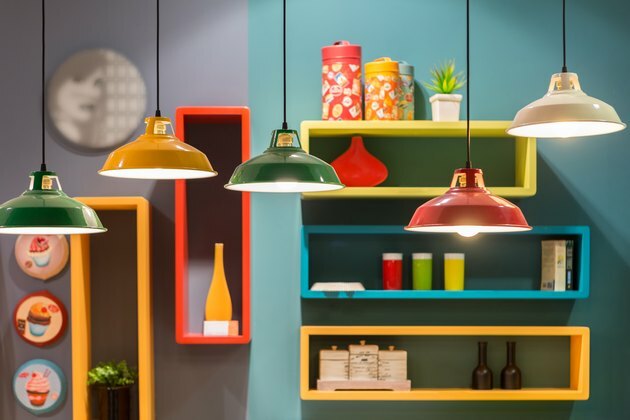 However, if you're bored with the shiny metal surface or want to wake up a tired rusted roof with a slick of bright paint, then there are a few things to understand about this popular home decor metal. By painting aluminum, you can easily breathe new life into dull siding, create unique metal art pieces for the home or resurface faded outdoor furniture. You can create farmhouse-style signs or modern designs with paint on ruffled or flat aluminum siding, which is much more attractive than plain aluminum. While painting aluminum increases its aesthetic, it also prolongs its life with a hard-wearing top coat of paint and sealant that can stand up to harsh weather and soaring temperatures. Aluminum can attract dust and dirt to its shiny surface, which can build up over time whether it has been stored indoors or outdoors. If the aluminum is outside, use a power washer to remove all grit and grime that can stick to the aluminum surface. For truly greasy or dirty aluminum siding or other outdoor pieces, use a commercial degreaser in the power washer or sprayed on the surface to ensure it is as clean as possible and ready to take on primer and paint. For indoor projects, clean the aluminum by hand with a scrub brush and a spray bottle of degreaser. Make sure you have proper ventilation to clean and paint the indoor aluminum project. Allow the piece to dry thoroughly before beginning the next step. The blasting unit should only be used outdoors and on large projects. If you have a small indoor project, then the aluminum oxide sanding paper and a handheld tool should do the trick. The non-porous surface of aluminum simply doesn't hold paint well. Experts agree that a primer allows all your painting efforts to last longer and look better on the aluminum surface. It will oxidize and chip without a proper primer. An acid-etch primer takes only a few minutes to apply and is ready to rinse within 10 minutes. They have the added benefit of removing any lingering patches of grease, oil or baked-in dirt on the aluminum surface. Apply a conversion coating to finish the acid-etching process. There are many types of aluminum primer to use after you have prepared the surface. They all work better than smearing paint on the slick surface of aluminum. You can choose to roll on, spray on or brush on a professional aluminum primer. Apply one or two thin coats of a professional aluminum primer. Let it dry thoroughly before applying the paint color of your choice. Once you have completed all these steps, the aluminum should take any interior or exterior paint without complaint. Finish with a good top coat sealer to ensure the paint doesn't chip, although this last step can be skipped. Aluminum spray paint is made specifically to adhere to aluminum products. It can be used both indoors and outdoors. It is quick to apply in steady streams. Many aluminum spray brands come with the primer, which cuts down on prepping, painting and drying time. The aluminum spray flakes in the paint create a longer-lasting surface.